The Dane County Farmers Market in Madison is back, and we actually got a day of sunshine to enjoy it. First stop, Stella’s for Hot & Spicy cheese bread. Stopping here first is crucial because not only can they sell out of this stuff, if you’re a farmers market usual like I am, you know you can pull it apart while you’re walking around. Cheesy bread is exactly what it sounds like — bread filled with stringy cheese. 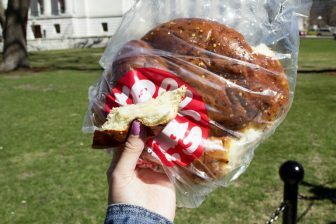 I’d compare the bread to challah. It’s light and fluffy but there’s still a lot to it. It’s topped with chili pepper flakes that aren’t too hot, but give it a nice flavor. Grab you bag of steamy cheesy bread and head up Fairchild. Bleu Mont Dairy should be your next stop. They’ve got all their cheese to sample. My two favorites are the roasted garlic cheddar and their chipotle cheddar. Using chipotle cheddar is a super easy way to spice up your quesadillas at home. There are going to be places for you to test cheese curds along the way almost endlessly, in a ton of different flavors. Pizza, garlic, bacon, chive, pepper — you get the gist. Once you hit the intersection, you’re gonna to see Gentle Breeze Honey. 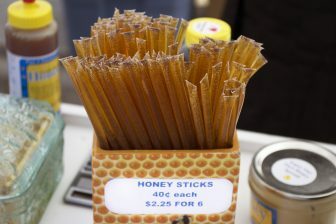 For less than a single dollar you can grab a honey stick. Pro tip: squeeze some on a hunk of your Hot ‘n Spicy bread. You cannot skip out on hitting up Savory Accents. They have this seven chili blend that will change your life. 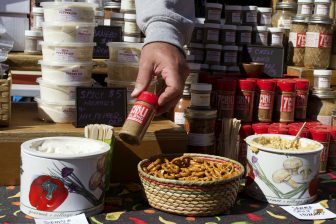 They mix it in their hummus and their hot pepper dip (both available to sample with pretzels). You should buy your favorite and continue on your way while casually dipping your trusty sidekick Stella’s Hot ‘n Spicy cheese bread. Are you noticing a trend? Now I’m going to blow your mind. 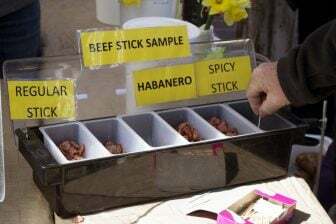 Head to Murph’s and grab some samples of their beef sticks. Stick. Those. Samples. In. Your. Cheese. Bread. It’s like my greatest Jimmy Neutron brain blast to date. Slap some of that seven chili blend dip on there and you have a full on sandwich. Now take a break and take in all of the plants and flowers and gourds that fill the spaces between snacks at the farmers market. Maybe snap a few pictures in front of the capital on the corner of Fairchild and Doty. If you haven’t ventured inside of the capital you’re missing out. 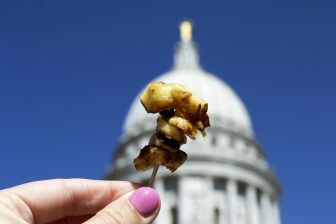 There’s a huge mural on the rotunda inside and the view from the balcony outside gives you panoramic views of Madison. 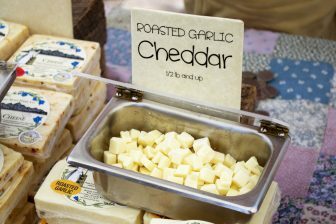 But if you’re just in the mood to power through the market, the next spot of utmost importance to visit is Brunkow Cheese. Specifically Brun-uusto — cheese on a griddle that doesn’t melt. What? If you skipped on the spicy cheese bread (Why?) and skipped the seven chili dips (How? Did you try it? ), yet somehow walked past all that cheese and didn’t spend all your cash — it’s fine. Now you can spend it all at Brunkow. They have flavors including garlic, bacon and pizza, but the best is jalapeño. And with that, you’ve concluded my snacking tour of the Dane County Farmers Market. I usually find a way to spend at least $20 every Saturday, but now you know what the highlights are! 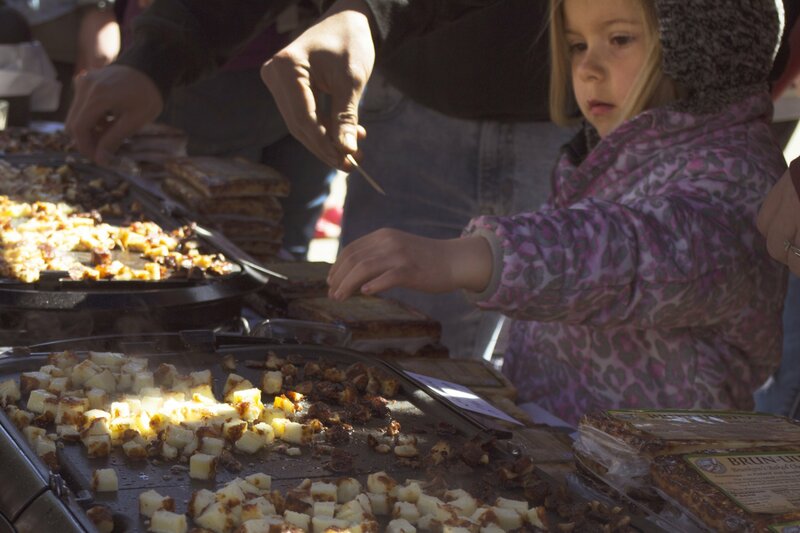 From 6:15 a.m. until 1:45 p.m. every Saturday, you can visit the Square and support Wisconsin’s local businesses, all while you fill your tummy.